Clustered Mountain Mint smells delicious when you brush against it and I always make a point of doing just that when I pass it in the garden. But, what generally grabs one's attention are the showy silver bracts that highlight the dense clusters of small pink spotted flowers from summer to early fall. The flowers of Pycnanthemum muticum might be small, but they are mighty! The researchers at Penn State's The Pollinator Trial found that Clustered Mountain Mint was the best plant for flowering longevity; for pollinator visitor diversity; for sheer number of insect visitors (78); and, for sheer number of bee and syrphid visitors. That's one powerful pollinator magnet and one powerful reason for planting Clustered Mountain Mint in your garden. I planted it before I knew it was a pollinator magnet or saw the silvery bracts and the cute flowers. I fell in love with the silvery gray seed head that stood straight and tall and grabbed my attention across the nursery aisle. I had to have it in my garden! It's planted in the Garden of Benign Neglect beneath the Hamamelis vernalis and the Itea virginica where it can have the moist soil it prefers. It's a no maintenance beauty that tolerates our summer dry months. It spreads a little, but, not aggressively. I don't know how it would behave if it had constant moisture, but, I don't think I would mind a ground covering of this fantastic pollinator plant. 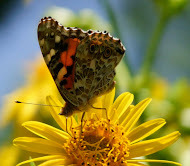 Close your eyes and picture it blowing in the breeze with bees and butterflies dancing above it. Now go find some plants to add to your garden! As you may have already guessed, this mint family member has all the properties of most mints! Square stems, flowers in long clusters, heads, or interrupted whorls on the stem, a nice spearmint scent when the leaves are crushed and like other mint relatives...it's a vigorous grower if you love it or a thug if you don't! Plant it with moisture loving false dragonhead/obedient plant and monarda/bee balms and let them duke it out. Or, plant it in a container, so you can control the growth. Maintenance: Let it go and don't worry, unless it's too dry. Naturalizes: Mountain Mint is a perfect Clay and Limestone rough and tumble take care of itself wildflower. Extra: It's an insect repellant! Try rubbing bruised leaves and stems on your clothing to deter chiggers and mosquitoes. Welcome to Clay and Limestone's Wildflower Wednesday celebration. WW is about sharing and celebrating wildflowers from all over this great big, beautiful world. Join us on the fourth Wednesday of each month. Remember, it doesn't matter if they are in bloom or not, and, it doesn't matter if we all share the same plants. It's all about celebrating wildflowers. Please leave a comment when you add your url to Mr Linky. This is a fantastic plant! I had mountain mint in my garden but lost them over our cold winter and I have to wait until our native plant sale in the fall to replace them. I also planted mountain mint this past fall in the meadow and will have to finally get out there and see if it is growing. I am not sure which mountain mint I planted but this is one I will add if mine is a different variety. Love the little flowers. Wow! That's a great plant for your gardens. So many good points about mountain mint and those flowers are the cutest! Your photos are just beautiful, too. I love the flowers ... they're tiny charmers! Well, if it can be grown at Penn State it would surely grow here. I have never seen it for sale or heard of this plant. I would love to grow it if I could get a hunk of it. I will keep my eyes open looking for it. It sounds great and looks even better. Clustered Mountain Mint sounds like a worthy plant to add. I wrote about a "bad guy" for Wildflower Wednesday this time, a plant I fell for that was doing dirty deeds behind my back. you've reminded me to add my wild mint to the list of plants to harvest for moving to the new garden. We have aloes, red hot pokers and Lachenalia rubida to fire our mid-winter. Mountain mint is a beauty, I always have a place for silvery native plants. The flowers are especially delicate and with that striking seedhead it's a good one for a garden with room to grow. I have been wanting a Mountain mint after seeing so many here and elsewhere, they are so appealing with the silvery bracts, so I seeded a couple this spring but only incanum came up, maybe next year they will be big plants. They aren't native here though. It seems a lot of plants I consider wildflowers are not native in the PNW, I grow some of them anyway but didn't include them in this post, just some native here. Regular mints do great here and the bees love them when they are blooming. I posted about Heliposis today. The garden fairies might have somehow gotten involved with the post, too. Thanks for hosting Wildflower Wednesday! Great plant, Gail! 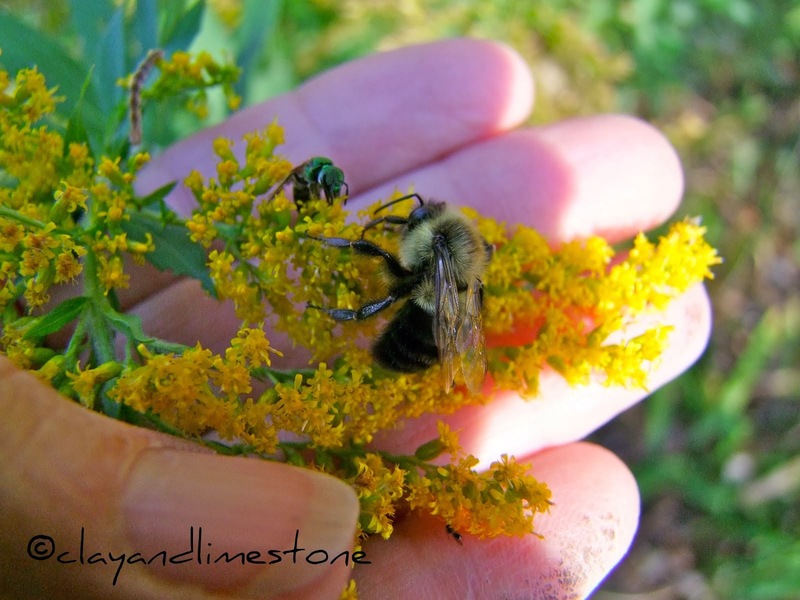 As I mentioned, the native plant gardeners at the UW-Arboretum like it, too, as do the native bumblebees. Thanks, again, for hosting this wonderful meme! Wow, it is hardy in zones 3 to 9. I see this sitting in the corner of my garden. Thanks for the great information. Glad to join in after finding your blog meme on Hannah's blog! I love wildflowers! You showed many beautiful ones! I've seen this plant on Sue Dawson's blog before and always thought it was pretty, but your images of it really show off its beauty. I love those silvery bracts! I always hesitate to plant any kind of mint--I have enough thugs here:) But planting it in a container sounds like a great idea. This is a beauty, and I was starting to say it is a different kind of Mountain mint than what grows here in my SE Nebraska garden, which I call Short-toothed mountain mint. When I looked that up, though, I saw it has the same botanical name. I also have Virginia mountain mint, P. virginianum, and Narrowleaf mountain mint, P. tenuifolium, which turned up in a list of good plants for Tennessee, when I looked up the botanical name. I'm thinking they spread more the first few years in the garden, then settle down a bit. I actually prevented much spreading of the P. Muticum by picking up the stems that were lying on the ground, getting ready to send down roots. I did not do that this year, and it has not spread much over the last couple years. I even decided to divide it so I could have some in another spot. I still have the photos for my WW post on my desktop, but am not sure whether they will end up in a post. I am excited to go out and do some gardening this morning, after spending lots of time helping our daughter, since she had a baby, who is now a week old. One of the gardens I designed at work for our summer display relies heavily on Pycnanthemum muticum. Everything we put in the garden was designed to attract pollinators, and I wanted it to be so alive with insect activity that people would be afraid to walk through it. LOL, Les! I hope you achieved your goal. I have some mountain mint, Joe pye weed, Liatris, and some others that the bees and wasps love right next to the sidewalk that comes up to our house from the street. I have been wondering if the mail carrier would decide he doesn't want to walk past them.